I sat down with Chris Brogan and Kris Smith (with special driveby guest Chris Messina) for a great podcast on BTRex during our last full day of SxSW this year which you can listen to here. We had a rollicking good time talking about social media and so much more. Some portions of it are potentially NSFW, and some aspects are not fully PC, but if your sensibilities can get beyond those minor issues, this is one heckuva entertaining and informative podcast. I still love the line I laid down during the opening section, “Serendipity is a weapon!” gotta love it.. and be careful of it. Will Tagging+Attention Make 2008 the year of Smart Agents? I am very glad he has brought this important topic back into the spotlight as we enter the new year. The lull in uptake of tagging, particularly in some new applications I have seen lately has actually troubled me. It is a feature that can provide so much added value for the people who use it (and those who will casually benefit from those who contribute to it) that I think it can be the difference between a success and a failure. In a future that leverage our Attention Data, we’ll be able to tag things in order to influence our Attention Profiles. What does that mean? It means that once you’ve exposed your Ma.gnolia APML (Attention Profile Markup Language) to your Bloglines RSS reader – then you’ll be able to influence the feeds that Bloglines recommends to you by tagging certain things in Ma.gnolia. The future Marshall references as point 5 1/2 is a very important one to consider – one that I think is indicative of a broader vision. It is, I believe deeply, the goal we should all be moving towards, especially in 2008. What we really need is smarter systems that do more for regular people automagically, tools that will recommend and deliver useful information, resources and services to us when we need it most without having to express more then our intentions, learning from everyone’s attention and explicit descriptions. First my apologies to anyone who received an email from me inviting me in to join the new network from Quechup. (which is a decent use of Drupal as far as I can tell) It was not from me and I feel harmed that any service would do this sort of deceptive mass solicitation without permission, trading on my good name and damaging the trust I have with my friends and colleagues. It seems a lot of other people fell into this trap too, so I can get past my embarrassment, but not the betrayal I feel. There is a great discussion about this all going on over at Chris Hambly’s blog. Ok, Todd Defren, I’ll bite and spread the meme, and answer the important question, what are my top 5 social media tools. Firefox – Most people forget the browser is still the core of the read/write web – I Mozilla for all my posting, tagging, editing and more – the latest crop of plugins and extensions make it invaluable – like being able to twitter from inside my URL bar! This is tied with WordPress for me. Delicious – God, how I want to quit you! With no real improvements in a very long time (that I know of), I have tried to quit it several times – even imported everything into Magnolia at one point – but the fact is that it is integrated perfectly into Firefox and easy to use. I just wish it had more auto-publishing controls as I mentioned to Joshua a couple times – make my link blogging look prettier – please? Since we need to pay it forward, I will need to tag Dave Coustan, Will Pate, Greg Narain, Grace Davis and Sally Falkow. A new friend of ours, Magic Safire, was asking us at Bloggercon which Blogging tool to use for a less technical user. Naturally I responded WordPress since I love it and think it hits the usability/configurability sweetspot for power users like me while still being simple enough for intelligent beginning Bloggers like Safire. If I had to answer that same question today, I would certainly pause a moment before saying the tool of choice is Vox. 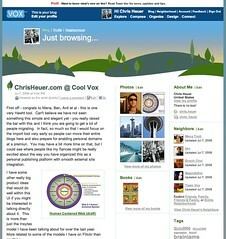 It is quite simply the best and most elegant UI I have seen when it comes to social media publishing tools. While I am sure I will find a few areas lacking as I kick the tires some more, I am just so blown away by how smooth an experience it is that I felt compelled to write a post on it using my Vox Site to suggest some ideas and try to publicly sell some product development ideas to them. After Gnomedex I was speaking with Kathleen Craig about what my big takeaways were for the conference. I really saw two big things that were new and interesting to me – 1, that Gnomedex is the new TED for social media tool developers and interested others and 2, that the most important and successfull companies today were really offering a UI solution, not a complicated/protected technology solution. Vox will prove this to be true or not. Though they are different products with different markets, in comparison to People Aggregator, which shares some backend philosophies, Mena, Ben, Anil et al are light years ahead. (BTW, Marc Canter – see a name like Vox falls within the name does not matter category – a name like People Aggregator just sux because it is too Orewellian – when you are ready for a new name and have some dollars to spend with a creative friend who does branding, call me). In regards to more direct competitors, Blogger may as well make plans to shutter its doors unless it decides to finally invest in some much needed upgrades in order to stay relevant in a world where people can Get the Vox so easily. Now once they have it setup so we can show our music too and share affiliate revenues with them on all the books, videos and other things that get aggregated there, I might switch myself. Make it easy and make it beautiful and they will come! You are currently browsing the archives for the Social Media Tools category.